Jill Page Associates is an Ipswich-based accountancy practice, dedicated to delivering exceptional client service. Following discussions between Jill Page Associates and Aston Shaw, a range of similarities between the firms were identified, and a decision has been made to merge for the benefit of both firms and clients. The notion of incorporating Jill Page Associates was initially proposed when it became clear that both companies shared a similar ethos, with their approach to client service aligning perfectly. Aston Shaw are keen to maintain the personal, one-to-one relationships that Jill has built with her clients over the years. 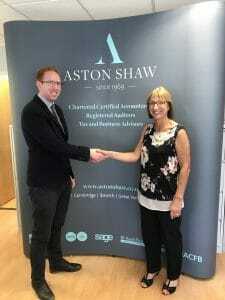 Jill Page herself will still continue to work closely with her clients; working from Aston Shaw’s Ipswich office. Access to Aston Shaw’s wide array of services and specialisms will allow Jill to provide a more comprehensive service to her clients. Aston Shaw would like to offer Jill and our new clients a very warm welcome and look forward to meeting new clients and staff over the coming weeks.